However, for marine life the danger posed by the improper disposal of “eco-friendly” plastics is very real. 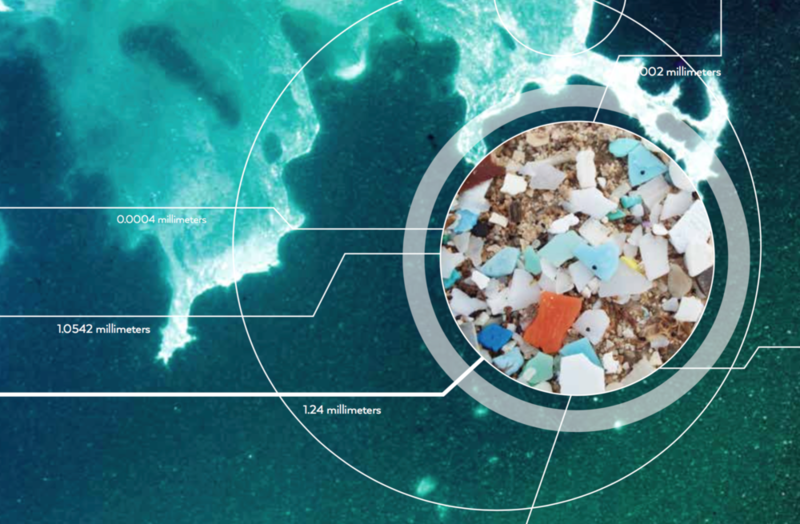 The microbes and high temperature that are needed for biodegradable plastics to fully break down into carbon dioxide, methane, and water, are rarely present in oceans. The lack of correct conditions for break down greatly increases the time it takes for the polymers to turn into safe compounds. UNEP estimates that 20 million metric tons of plastic ended up in oceans every year and this plastic doesn’t go away but becomes microplastic, dangerous to marine wildlife and ecosystems. Hi! I’m Lydia, and I’m a research assistant here at Return Recycling. I spent this past January to May living/studying/working in Accra, Ghana. I’m interested in the politics behind healthcare distribution and how they are influenced by the environment; it was because of this interest that I found myself touring Old Fadama, a slum in Accra built on top of a lagoon and infested with waste. Old Fadama, more popularly known as Sodom and Gomorrah after the biblical cities, sits on top of the Korle Lagoon and next to a large waste disposal site. Through one of my classes I had the amazing opportunity to take a tour through the neighborhood, led by local chiefs. This community is comprised of struggling families who have taken over privately-owned land to build homes and businesses with the hopes of fulfilling their livelihoods. Their health, however, is suffering due to close proximity to mountains of garbage. The lagoon on which they live is choked with debris ranging from e-waste to ordinary plastic bags. Children play in the garbage and cows walk through town to reach the trash, where they graze for any scraps of food intermingled with household and industrial waste. Most of this garbage will eventually be burned to create room for new additions because there is no efficient system in place to deal with trash; this is mainly a result of inadequate funding for public services. Recently this trash has contributed to disastrous floods during Ghana’s rainy season. In July, large amounts of rainfall combined with drains in the Korle Lagoon choked with waste led to deadly floods and fires. I know what you’re thinking--how does this affect me? Well, if you want a direct link, some of the United State’s e-waste ends up in the Korle Lagoon; your old desktop computer could be in Ghana. More generally, I’m telling you about Old Fadama because it emphasizes the idea that out of sight should not mean out of mind. In the United States we have companies that take our garbage away weekly or bi-weekly; it rarely piles up to the point where it becomes a nuisance. But just because we don’t have to look a garbage piles doesn’t mean they don’t exist. Garbage has to go somewhere, and in the case of Old Fadama it is right next to people’s homes and has become a focal point of the community. Every year since 1997, Starbucks has unveiled a new winter-themed cup design at the beginning of the holiday season. This year’s design is a minimalist red ombre, which has lead to uproar on social media with many users calling the cup a "War on Christmas." Here at Return Recycling we are not worried about the design on the cups, but instead about what happens to these cups after they are used. Toss the entire cup in the trash - Bad! Goes straight to the landfill. Recycle the cup and its contents - Bad! Just one semi-full cup of coffee can stain an entire load of recyclable paper, which most recycling carters will not accept. Straight to the landfill again. Empty leftover coffee into the liquid container, and recycle the coffee cup and lid - Good! Tar sands oil is one of the dirtiest oils produced in the global economy… by a long shot. In Alberta, Canada tar sands are stripmined in open pits that dramatically change the landscape. Previously well-functioning Boreal forest ecosystem ends up looking like the picture to the left. Once mined, these tar sands must be shipped to a refinery in the southern US; and then, after they’ve been refined into oil, tar sands are consumed (burned) and emit CO2. Throughout its lifecycle, tar sands oil produces an alarming amount of waste. The mined tailings, the waste-water created in the process of refinement, the CO2 emitted in the process of extraction, the CO2 emitted through consumption… it’s a process that bleeds from start to finish with byproduct that inevitably ends up externalized on society at large. We, the global collective, end up paying for the continued extraction and consumption of tar sands oil in ecosystem destruction, loss of biodiversity, contaminated waterways, and an atmosphere that is wildly out of balance with the pre-industrial carbon cycle. Considering the renewable energy options that are available today, tar sands extraction seems simply barbaric. It uses so many more resources than standard oil production that it’s only made economically viable by a high price for oil. The price of solar is dropping exponentially and electric cars are becoming increasingly more popular. Although renewable energies are not without their own waste, they externalize less of this waste upon people. If that’s the future we want, one with less waste, why would we extend our dependence on a fuel that is costly and wastes an abundant amount of resources? From a “zero-waste” perspective, the further (and the sooner) that we can move away from destructive methods of energy extraction like tar sands, the better. Although a pipeline isn’t equivalent to a mine, we’re celebrating Obama’s decision to reject the Keystone XL pipeline because it acknowledged the necessity of reducing American dependence on the wasteful methods of fossil fuel extraction. It was an homage to the thousands of organizers that campaigned for eight years against the pipeline; a line of hope to the frontline communities that stood in front of bulldozers; and a message to the industry that it must consider the will of the people in its future plans. Our lives are resources that should not be wasted, or disposed. The initiative succeeded in garnering 65,298 signatures and 605 posts on instagram were tagged #iwillrecycle. Some companies also took initiatives to reduce their waste through recycling. Dell sent Adrian Greiner, the Entourage star, out in New York City in an Uber to collect used electronics for their Dell Reconnect program. On the surface, America Recycles Day seems like a fine way to raise awareness on the issue of waste management and recyclable goods, but when we look deeper problems arise. The reasoning behind the problematic nature of America Recycles Day is hidden in plain sight. Keep America Beautiful was started by a coalition of corporations including, the International Bottled Water Association, PepsiCo, Coca-Cola, and Coors. They started KAB in 1953 when litter, that of their own disposable containers, was becoming an increasing issue in the US. Their message to the public was and still is a simple command: you should keep america beautiful, not us. Their focus is on making the consumer responsible for the trash the manufacturer created when switching to disposable containers instead of the previous refillable system. These same corporations fought against bottle bills, formally know as beverage container deposit legislation, which allow states to pay people for recycling bottles and now only exist in 10 states. Bottle bills are proven to increase recycling rates from 20.4% to 60%, as reported by the Container Recycling Institute. The question becomes do they really want to keep america beautiful or do they want to keep focus away from manufacturer and corporate accountability for waste? It seems they want consumers and waste infrastructure to be responsible for their trash and their systems of production and distribution to remain free from question. A popular sustainability news source, Treehugger, published several articles leading up to November 15th expressing their distaste for America Recycles Day based on these same issues and advocating for the transformation of America Recycles Day into Zero Waste Day, one day a year during which you buy nothing that comes in a disposable container. This still puts the pressure on the consumer instead of the manufacturer, but it takes away one day of sales for all companies who use disposable packaging. Zero Waste Day, although still focused on an individual instead of corporate change, poses more of a threat to businesses like those who started Keep America Beautiful. At Return Recycling, we’re working on ways to promote sustainable businesses who make their own zero-waste efforts instead of relying on the consumer to recycle their waste or find ways to reuse it. But what makes a company “sustainable” to begin with? More to come on that soon. One Fish, Two Fish, Eat Fish, Lose Fish? A purse seiner catching tons of mackerel in Chile. Johns Hopkins put out a research report not too long ago showing that nearly half (47%) of the U.S. seafood supply goes to waste. Some of that is from bycatch, distribution and retail operations, but the big chunk (almost 60%) is at the hands of consumers: a whopping 1.3 billion pounds of seafood is wasted by American seafood eaters every year - enough to fulfill recommended seafood consumption requirements for 10,000 American men. Wasting all that fish (and crustaceans, cephalopods, etc.) is an issue, to say the least. Putting seafood to waste has a whole spread of negative impacts, like overfishing, habitat destruction, pollution, coral reef bleaching, and global climate change. Considering the Office of Disease Prevention and Health Promotion is telling us to eat even more seafood, we have to be pretty darn careful with how much we’re buying and eating - or rather, not eating. A little meek, don’t you think? I mean yeah, making change at the consumer level is hard! There are no easy answers - if there were, the whole national seafood waste thing wouldn’t be a mostly-consumer issue. That said, I like to think there are a few other options for change to be made at the consumer level. The first that comes to mind is to cut seafood out altogether and go for the total veg-head lifestyle (and still be just as healthy!). Not purchasing fish would certainly eliminate the risk of it being wasted. But in this context, that might be a little bit extreme for some people. In lieu of vegetarianism, there are other options for education-driven change, like educating consumers on how to purchase seafood in appropriate (non-wasteful) portions, how to buy from responsibly-sourced (local, sustainable, small-scale, ethical) vendors, and how to maximize the consumptiveness (longevity, quality) of their seafood. This all comes from an increase in information about the dangers of the seafood industry and seafood waste - we need to keep doing these sorts of studies and putting them out in the mainstream in order to build a national conversation around the issue. About two weeks ago, I trekked out to Staten Island for a field trip with my Trash Matters* class to stand in a park that was built on top of what was, at its “peak,” the largest landfill in the world: Fresh Kills. I know probably more than I’ll ever need to (though I suppose you never know) about the history and engineering of Fresh Kills, but what strikes me most is what you could call the philosophical implications of just plopping a park on top of what was once a gigantic, ugly (in a lot of ways) scar on NYC. So let’s start with that: the covering up of something so ugly, and yet so indicative of the damages wrought by our consumerist society (too heavy?). Think about it, here’s this enormous illustration of how wasteful our culture is - which brings to light all these other, connected issues too, like environmental justice, institutional racism, corporate responsibility - and we’re just going to go make it into a park. I don’t mean to diminish all of the benefits of creating Fresh Kills Park: increased access to green space, community health and wellbeing, intergovernmental collaboration - and transforming something harmful and representative of human ills into something beautiful and shared. But all of these benefits (and that last one in particular) can end up being problematic. We have to be really careful to not render our waste invisible. It’s such a huge issue: we’re already so detached from our waste (philosophically, culturally, physically) that even talking about garbage is still a turn-off. So by covering it up, we’re not only refusing to talk about the truths that defined the space for so long, but we’re adding to the current societal movement in the opposite direction of the environmentally and socially responsible treatment of waste that we need! Fresh Kills has the awesome opportunity to become a memorial (for lack of a better word) to its waste history. It’s a chance to put to use something that has marred our conception of our society as something productive, progressive, and responsible; to actually be those things! Fresh Kills could - and should - be made into an educational experience, through art, science, and community building. We have the chance to engage with our entire city (and beyond) around creating a world that is not only aware of their waste and its implications, but is proactive in using that awareness to improve the global garbage system. The history of our waste can’t be wasted. Fresh Kills Park is scheduled to open in phases up until its complete opening in 2036. *Shameless plug for Trash Matters, an excellent class taught by Rosalind Fredericks at NYU’s Gallatin School of Individualized Study. If you’re at NYU: take it. Do it. Over the course of Spring 2015, Return Recycling sorted through about 150 pounds of trash from NYU’s Silver Center for Arts and Sciences. Yes. You heard that right. Every Monday, between the hours of 9am and noon, we opened up NYU’s garbage bags to see what people were throwing away and created an itemized list of EVERYTHING that students were disposing of in public spaces. We’ve taken a mini snapshot of results from that study to share with you today. It may not be a surprise that 78% of all the items thrown away in NYU’s lounge spaces were food-related; but the breakdown of that “food-related waste” might turn some heads. Coffee cups (and all their attachments: sleeves, straws, lids, etc.) made up a whopping 21.1% of total trash, napkins alone comprised 15.1%, plastic bags and wrappers totaled 10.7%, food waste itself counted 8.9%, bottles and cans were only 5.3%, to-go containers came in at 4.9%, and paper bags counted as 2.5%. There are many other items I’m leaving out, disposable plates, plastic cutlery, and other miscellaneous items, but they’re noticeably smaller percentages of the total waste disposed (think .5% and smaller). What’s that tell us necessarily? Well… you’re not the only student with a coffee addiction or the desperate need for a mid-day snack. The majority of student waste in the Silver Center can be tied back to the disposables received from local food vendors around Washington Square Park. More fun still… in the coming weeks we’ll release information on what companies students using the spaces in Silver are purchasing most of their coffee, lunch and snacks from based on the trash that was well-labeled. Hint: it’s not the dining hall. With just this basic information on trash by category though, it’s possible for us to imagine ways of dramatically reducing the waste that students dispose of on a daily basis. If we want to attack the heart of waste issues at NYU, this study tells us we should probably start by addressing disposables associated with food industry around the square… and figuring out a way to shrink the number of coffee cups students toss every day. In our study we counted the different components of “coffee cups” as separate items. Why? Not every coffee cup had a sleeve, lid or straw—and in many cases these different components were made out of different materials. When we look at each of these components alone; coffee cups (plastic and paper) comprise about 8% of the total trash, lids make 6%, straws make 3.9%, and sleeves make 2.8%. So in reality the 21% might seem a bit of an inflated statistic, but it shows just how many separately manufactured items are simultaneously being disposed of. Three weeks ago, NYU had a zero waste challenge sponsored by the Office of Sustainability, ECO Reps, Earth Matters, and us, Return Recycling. Students pledged to send no waste to landfill for a week and to kick it off hosted three influential, but vastly different, figures in the current zero waste movement: Samantha MacBride, Lauren Singer, and Colin Beavan. Each speaker’s idea of zero waste is different as a prior employee of the New York City Department of Education and a professor at Baruch College, a lifestyle blogger and small business owner, and as a writer and activist responsible for No Impact Man, respectively. Samantha MacBride claimed that zero waste is an “aspiration that shapes policy.” Lauren Singer’s lens is that of the individual making a conscious lifestyle choice by sending nothing to the landfill and not purchasing new products to decrease the demand for “brand new” and “built to break” items. Colin Beavan views a waste of resources as a waste of human happiness on superfluous things that we don’t really need. Throughout the panel problems within everything from waste infrastructure to capitalism were discussed. There seemed to be a divide between panelists, MacBride was more focused on improving the infrastructure of waste management to better accommodate our current society while Singer and Beavan felt more strongly about vast social change towards a world where no one eats wrapped granola bars and no one drives cars. Building things to last and holding companies accountable for their trash were two raised issues that relate to Return Recycling specifically. We’re working on promoting increased use of reusable products instead of their disposable counterparts that we find in our bins. We’ve also collected data on what companies are responsible for the trash sent to landfill from NYU and hope to promote companies who adopt or have already adopted zero waste efforts. Check back tomorrow for an update on our research findings from Davis. Halloween is coming up soon and you know what that means…decorating time! Today I’ll be showing you a super easy way to make mini ghosts by reusing your plastic bags. Did you know? According to National Retail Foundation, U.S. spending on decorations for Halloween in 2015 will amount to $1.9 billion. The mass production of decorations can generate lots of waste. Many of these items end up in the landfill, polluting everything around it. However, you can reuse and make your own Halloween decorations. Save money and the earth! 1. Cut off the handles of the plastic bag. 2. Cut the bag into either rectangles or circles. Whatever shape you choose, it will determine the bottom edges of the ghost. 3. Fold the piece in half and twist the middle, so the top section looks like a balloon and the bottom forms a skirt. See picture for reference. 4. Tape the twisted part so it doesn’t come undone. 5. Use your fingers to puff out the balloon part to make your ghost have a head. 6. Get your permanent markers and draw a face! 7, Tape it to the wall, or hang them in a row. Even in its developmental stage, a solution to styrofoam waste would be monumental in the reduction of solid waste worldwide. "Rendering waste invisible to its producers is now made all the easier by flows that take used commodities from consumers and break them into various constituent parts elsewhere around the globe. Discarded clothing, consumer durables, electronic goods, paper, and plastics have global circulations to differentiated destinations [for instance, e-waste in West Africa, and Southern China or textiles in India, where they are 'recycled' into yet further commodities."